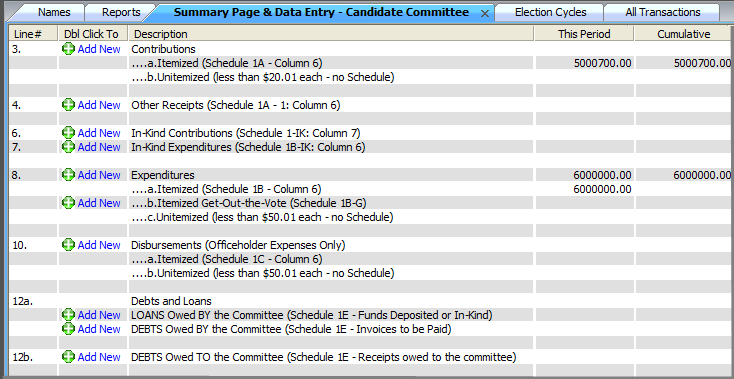 New transactions such as contributions and expenditures are entered via the Summary Page & Data Entry tab. The Summary Page and Data Entry tab must be opened. The Summary Page and Data Entry tab can be opened after a report is highlighted in the Reports tab. 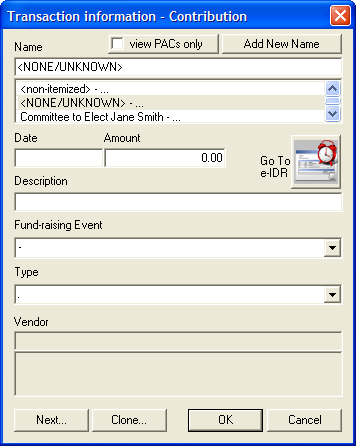 The All Transactions tab is the only tab screen where transactions can be amended, modified, deleted or de-reported. Under the View menu select Summary Page & Data Entry. Double click the Add New to add a new transaction as seen below. Continue to add the date, amount and other requested information. Click the Fund Raising Event drop down to select the appropriate event if applicable. Select Ok to save the entry and close out of window. Select Cancel to close out of the window without saving the entry. 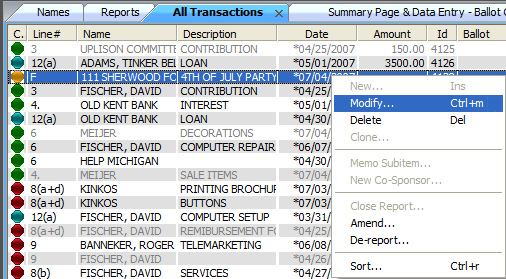 To Modify an existing transaction open the All Transaction tab and locate the desired record. Select the Modify item icon on the toolbar or right click and choose Modify to make the necessary changes. To Delete an existing transaction open the All Transaction tab and locate the desired record. Select the Delete icon on the toolbar or right click and choose delete. Please note the transactions within a closed campaign statement cannot be deleted. Note: To remove a transaction from a previously filed report, select ‘De-Report’ to remove the the transaction from the amended campaign statement. The original transaction will continue to show in the ‘All Transactions’ tab as a shaded item.